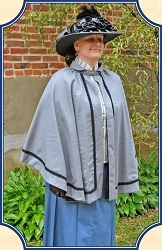 A long Ladies Victorian Wool Cape in the Kinsale style. Lined or unlined with a classic pewter clasp at the neck. 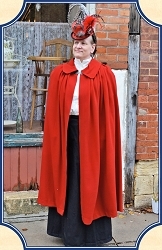 Short Victorian Ladies Cape Inspired by the Salvation Army. Made in a Midnight Navy Dress Wool. 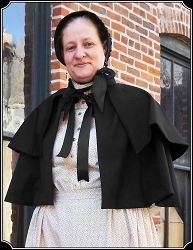 A wonderful wool three-quarter length Victorian style cape, lined, and trimmed with exquisite black braiding. Elegance in simplicity. 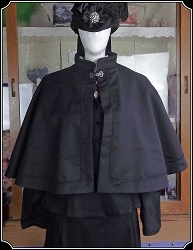 Our authentic Ladies Victorian reproduction Wool Short Capes are fully lined and offer wonderful protection from the elements. 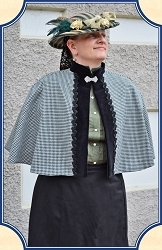 Lovely with a touch of whimsical, this Victorian Ladies Two Layer Cape is made with Dress Wool and lined with cotton. Made to your order, allow 4 - 6 weeks. 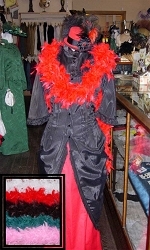 A feather boa is a fashion accessory that is usually worn wrapped around the neck like a scarf.